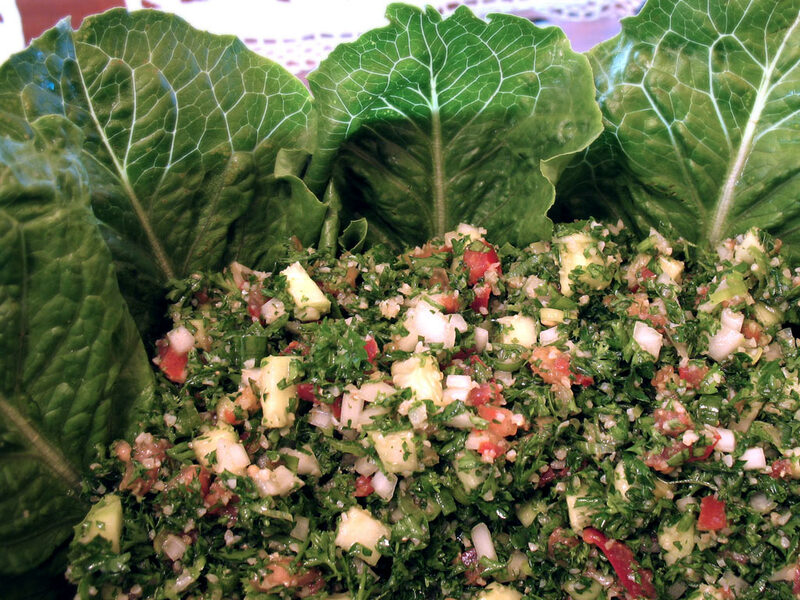 This parsley and bulgur salad is a great summer side dish. Unlike Americanized versions that contain mostly bulgur, this traditional recipe from The Complete Armenian Cookbook focuses more on the parsley and other vegetables (tomatoes, onions, cucumbers) present. In a mixing bowl combine the bulgur and the tomatoes with their juice. Let it sit at room temperature for 30-60 minutes, until the bulgur is soft and all the liquid from the tomatoes is absorbed. Add the other vegetables and mix thoroughly. Combine the dressing ingredients in a separate bowl and start pouring over the bulgur mixture, stirring as you pour. Stop when the vegetables are well coated (you don’t want it swimming in dressing!) Chill. Surround with Romaine lettuce leaves for garnish… and scooping! This entry was posted on Monday, July 2nd, 2007 at 9:17 pm	and is filed under Armenian, Middle Eastern, Salads and Light Soups. You can follow any responses to this entry through the RSS 2.0 feed. You can leave a response, or trackback from your own site. Thank you! I’ve looked for a good Tabbouleh recipe to no avail. I’m going to try this when my family and I get over the flu. idb — Let me know how it turns out!